The Greek philosopher Plato argued that reality was inherently flawed, and that only ideas themselves could be said to be perfect — each being a sort of incorporeal ideal from which all physical manifestations tried to replicate to various degrees of imperfection. Why do I mention this? 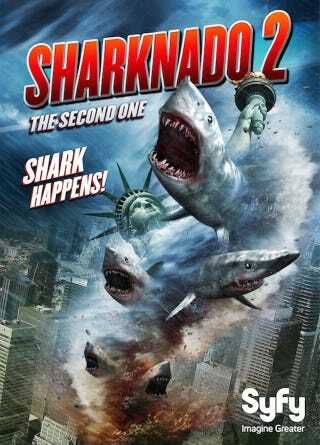 Because I'm pretty sure this Sharknado 2 poster is the Platonic ideal of awesomely bad movie posters. Well done, Sharknado 2. You've broken the entirety of Western philosophy with your ridiculous movie.